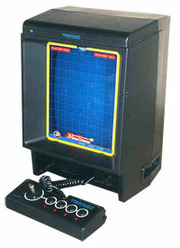 The Vectrex was a home console system that was unique in the field due to the use of a built-in vector monitor to display the games. Introduced in June of 1982 by General Consumer Electronics (GCE) at the Summer Consumer Electronics Show (CES), it was available for retail purchase at $199 in October of that same year. In March of 1983, Milton Bradley purchased GCE and began distributing the Vectrex to a more expansive distribution network, to some success. However, changes in the market caused Milton Bradley to first discount the system ($150, then $100), and then ultimately close down the GCE division in summer of 1983. The limited lifespan of the Vectrex is reflected in its relatively small library of games released for the platform, but a robust homebrew culture has caused a number of programs and games to be released over the years. The games usually make the most of the Vector monitor's unique approach to image creation to both duplicate other vector games of the time, and also provide an opportunity to create unusual images and sounds from the hardware setup. Designers associated with the Vectrex include Mike Purvis, John Ross, Jay Smith, Gerry Karr, John Hall, Walter Nakano, and Colin Vowels. This collection makes available as much of the Vectrex platform's documentation, programs, related audio/video material and history as could be found. Credit is given the many historians and fans over the years for their efforts in preserving the items and artifacts that make up this collection.